By the end of the 12th century, the Archbishop of Cologne was one of the seven electors of the Holy Roman Emperor. Besides being prince-elector, he was Arch-chancellor of Italy as well, technically from 1238 and permanently from 1263 until 1803. In the Battle of Worringen (1288), the archbishop was captured by soldiers of the city, and was forced to grant the city near-complete autonomy. Eventually, the archbishop moved to Bonn to escape jurisdiction conflicts with the city government. In 1475, Cologne became a Free Imperial City, independent from the archbishop. The first pogrom against the Jews was in 1349, when they were used as scapegoats for the Black Death, and therefore burnt in an auto-da-fé. Political tensions arose from issues of taxation, public spending, regulation of business, and market supervision, as well as the limits of corporate autonomy. Long-distance trade in the Baltic grew, as the major trading towns came together in the Hanseatic League, under the leadership of Lübeck. It was a business alliance of trading cities and their guilds that dominated trade along the coast of Northern Europe and flourished from the 1200 to 1500, and continued with lesser importance after that. The chief cities were Cologne on the Rhine River, Hamburg and Bremen on the North Sea, and Lübeck on the Baltic. The economic structures of medieval and early modern Cologne were based on the city's major harbor, its location as a transport hub and its entrepreneurial merchants who built ties with merchants in other Hanseatic cities. During the 16th century, two Archbishops of Cologne converted to Protestantism. The first, Hermann von Wied, resigned the archbishopric on converting, but Gebhard Truchsess von Waldburg, who converted to Calvinism in 1582, attempted to secularize the archbishopric. His marriage the following February, and his refusal to relinquish the territory, resulted in the election of a competing archbishop and prince-elector, Ernst of Bavaria, brother of the Wittelsbach Duke of Bavaria. In the Cologne War that followed, the pope funded Italian and Spanish mercenaries and the Catholic Bavarians also sent an army to support Ernst, while the Protestant Netherlands supported von Waldburg. The war ruined most of the Electoral economy, and many villages and towns were besieged and destroyed. The Siege of Godesberg in November–December 1583 ended with the destruction of Godesberg Castle and the slaughter of most of its inhabitants. After several more sieges, von Waldburg gave up his claim to the see and retired to Strasbourg with his wife. Ernst became archbishop–the first major success of the Counter-Reformation in Germany. Under Ernst's direction, Jesuits supervised the reintroduction of Catholicism in the Electorate. From 1583 to 1761, the archbishopric was effectively a secundogeniture of the Bavarian branch of the House of Wittelsbach. As the archbishop in this period usually also held the Bishopric of Münster (and often the Bishopric of Liège), he was one of the most important princes of northwestern Germany. After 1795, the electorate's territories on the left bank of the Rhine were occupied by France, and were formally annexed in 1801. Cologne was part of the département of Roer; Bonn was part of the département of Rhin-et-Moselle. The Reichsdeputationshauptschluss of 1803 secularized the rest of the archbishopric, giving the Duchy of Westphalia to the Landgraviate of Hesse-Darmstadt and Vest Recklinghausen to the Duke of Arenberg. 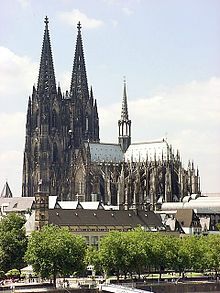 Cologne was, however, reestablished as the seat of a Catholic archbishop in 1824, and is an archdiocese to the present day.